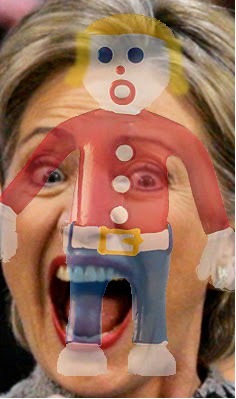 I must admit I never understood why people thought SNL’s Mr. Bill feature was funny, but it does provide a vehicle for poking fun at Mrs. William Jefferson Clinton. Because everything she has achieved has been made possible by a man. Because Hillary was Bill’s enabler*: She reflexively vilifies the women her husband molests in order to preserve her path to power privilege. Because “Ohh Nooo!” was Mr. Bill’s (the play-dough Mr. Bill) signature laugh line. It’s what we would all be saying were Mrs. Bill elected President. I mean you got to understand at one time there was at least 25 women per day coming through there trying to find him, and I’d tell them he’s out on the road, you know and they’d get out the door, but lord it was bad. Bad, bad, bad, bad, bad. Mrs. Bill’s claim to have been blindsided by the Lewinsky affair over 20 years later should be considered in that context. She sold her dignity for power. As the foreign contributions to the Clinton Foundation demonstrate, that’s not all she’ll sell. Previous Post Can I call her "Network Administratrix?"